This is the dream game I've wanted to make for years. I plan on releasing it before I graduate from college in Spring 2016 and having it available on Mobile and PC platforms for $4.99. The success of this game will determine if I'm cut-out for a career in indie game development so I'll be putting everything I've got into making it the most awesome game it can be. A huge announcement post filled with details can be found on my developer blog where I will be posting updates every Tuesday and Friday. I'll be sharing all my major milestones here. 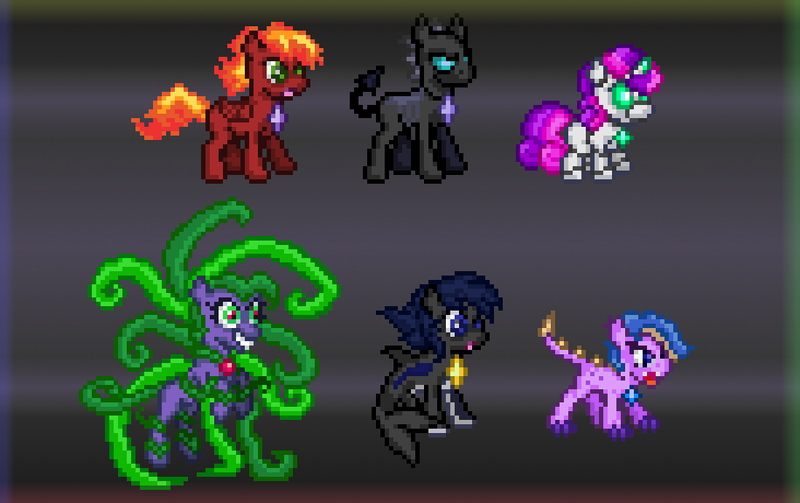 Welcome to the Battle Gem Ponies official Pre-Alpha thread! BGP has been an idea swimming in my head for years before finally starting development in December of 2014. It was inspired by a Fire Red ROM Hack called Ponymon where the Pokemon were replaced with MY Little Pony characters. The hack went unfinished for years and the story didn’t seem to do much more than name swap and make friendship references. I wondered how cool it would be to see that MLPxPokemon idea taken all the way and turned into a completely new adventure. Fan games like Pokemon Uranium and Fighting is Magic inspired me to take up programming in high school so I could make fan games of my own. Specifically, I always wanted to make my own Pokemon game that did away with all the parts that annoy me. Things like grinding, HMs, easy fights, and evolution lines with stats too low for competitive viability would be no more! First attempt at making such a game didn’t go too well, so I spent the next 7 years practicing game development (even getting a degree in Gaming & Simulation) to build the skill necessary to craft a full-blown RPG like this. Over the years the game has gone from overambitious Pokemon fan game to overambitious Pokemon clone with its own IP. Lots of blood, sweat, and tears are going into making this game a success. I hope Battle Gem Ponies is turns out as good as the game I see in my head. I can’t be the only one who would like to play a game like this, right? Thanks for checking out the project and enjoy the demo! Command super-powered, shape-shifting ponies in strategic turn-based RPG combat. Embark on a journey to become the best pony trainer in the world and protect the world from those who want to use the Legendary Alicorns of the Sun and Moon for evil. Battle other players locally in a variety of multiplayer modes using either a team developed in the single player mode or by selecting and customizing a team from a list of available ponies. 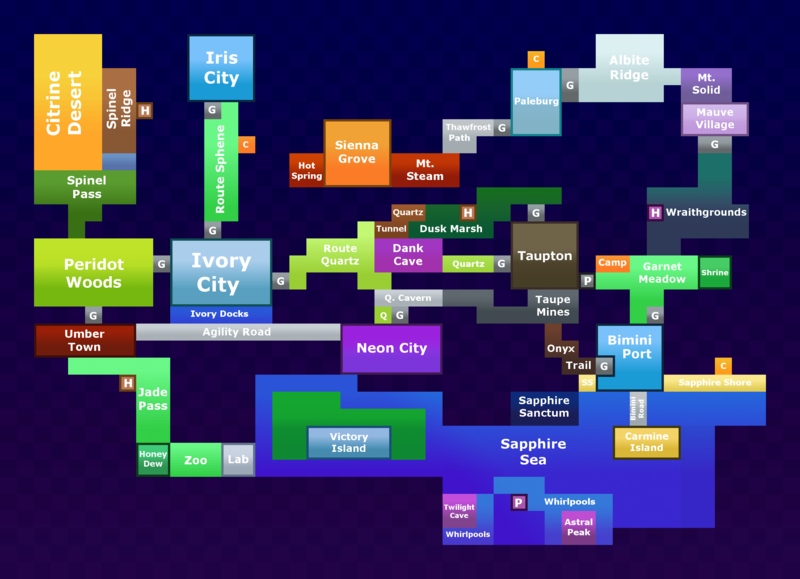 A colorful and varied region with a gemstone motif and mysteries scattered across the map. It's meant to be an adventure lasting at least 6 hours on average. Preferably longer, and extended indefinitely with post-game content. The environments should be visually varied and filled with enough story content to keep the player interested in progressing. Follow the game on your favorite social media sites to get the latest news and have your burning questions answered! Interact with Yotes Games on any of the sites below. The latest current build is version 5.1, now available on Itch.io! 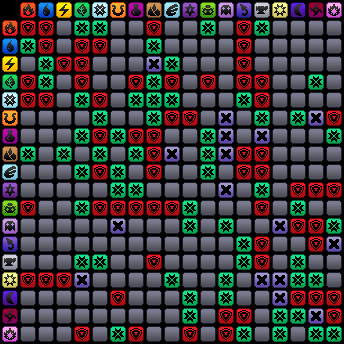 Available for Android, Windows, Mac, and Linux platforms. 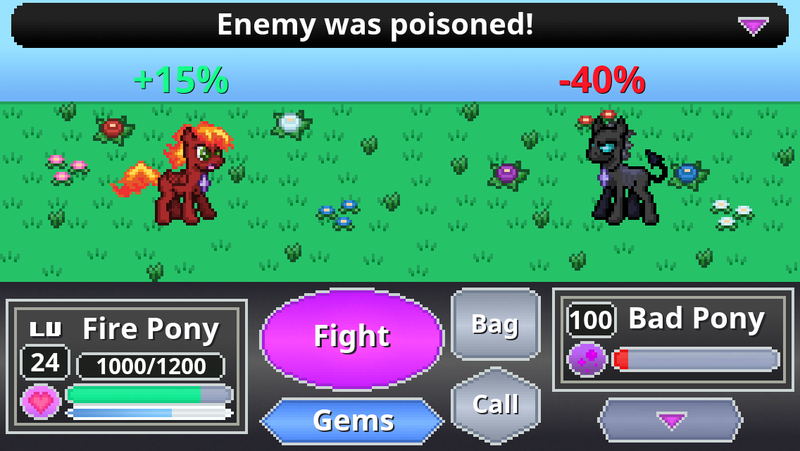 Demo V5 contains 3 areas, 6 ponies, and a Random Battle Now mode. Combat calculations may exhibit bugs. There is a gallery of mock-ups on my Facebook page. 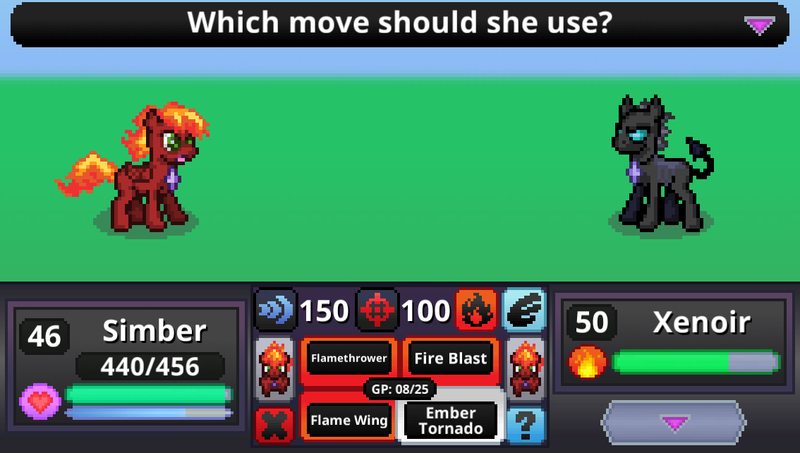 It's week 5 of development for the Pokemon inspired Battle Gem Ponies game and I wanted to share all the big milestones that happened so far. You can still find updates on the game twice a week on the Yotes Games Blog. The elemental chart is complete along with explanations on each pony class. Find all the details on the Dev Blog. Check out this week in gamedev on the Yotes Games Blog! You can find the usual status report information on the Yotes Games Blog. I'll be talking more about these guys all week. With the BYOC demo on the way I got to thinking about all the heck I'm in for as I work day and night to get this game out before the holidays. It's going to be one very busy summer. I just wanted to share what's to come playtest-wise.